While a comprehensive discussion of the effects of the marine environment on salmon is beyond the scope of this chapter, this section provides a brief summary of the apparent effects of ocean conditions on salmon both during El Niño events and over longer time periods. Some plausible explanations of the mechanisms that might relate changes in ocean conditions to salmon harvests are discussed. At sea, salmon are constantly moving (Quinn & Groot, 1984). Their migratory patterns and behavior are believed to enable salmon to make use of abundant food resources available on a site- and time-specific basis in a major ocean ecosystem (Gross et al., 1988). This would tend to make salmon survival and growth a potentially good indicator of ocean conditions over a wide area. Large shifts in ocean temperatures and productivity would likely be reflected in changes in abundance. However, while considerable progress has been made at unlocking the oceanic "black box" into which salmon swim as smolt and from which salmon return as adults, much remains unknown (Walters et al., 1978). A considerable amount is known about the general migration patterns and behavior of salmon and substantial work has been done to identify the ocean distribution of each species (see Dodimead et al., 1963; Favorite et al., 1976; Pearcy, 1984). However, there is little systematic monitoring of ocean conditions, or of the spatial distribution of salmon stocks at any given time. If a marked change in the marine environment, like an El Niño event, could be adequately monitored, it might provide a sort of natural experiment. Such an event might yield information about the effects of climatic variations on salmon and, perhaps, insights into the potential impacts of climate change (Walters, 1988). El Niño is the name given to the occasional invasion of warm surface water from the western equatorial part of the Pacific Basin to the eastern equatorial Pacific, where these events produce a rise in sea level, higher sea surface temperatures and a depressed thermocline (Namias & Cayan, 1981; Cane, 1983; Philander, 1983; Rasmusson & Wallace, 1983; Rasmusson, 1985). El Niño is a recurring, quasi-periodic phenomenon associated with a reversal of barometric pressure between the eastern and western tropical Pacific, known as the Southern Oscillation. These events are most frequent in the equatorial Pacific but infrequently they affect the west coast of North America as well (see Wooster & Fluharty, 1985). In the northeastern Pacific, evidence of the impacts of strong El Niño events can be seen in elevated sea levels (5-20 cm), higher sea surface temperatures (1-3°C) and warmer subsurface temperatures (to 300 m). Three such events are documented in the northeastern Pacific, north of central California: 1940-41, 1957-58, and 1982-83 (McLain, 1984; Fiedler, 1984; Tabata, 1984a; Cannon et al., 1985). showed considerably reduced survival compared with predicted survival. • Coho and chinook salmon in the OPI area were generally lower than average in weight during this period. • There was poor survival of coho salmon smolts in the OPI area. • Sockeye salmon from the Fraser River system altered their migratory route around Vancouver Island, with an increased proportion returning through Johnstone Strait (Fig. 4.6). Fig. 4.6 Return migration routes, Fraser River sockeye salmon. Ideally, the effects observed above could be compared to those observed during a series of El Niño episodes as a means of establishing a pattern. However, due to the infrequent occurrence of the impacts of El Niño events in the northeastern Pacific and the lack of a consistent ocean environment/fisheries monitoring system, only tentative conclusions can be drawn about the former effects of El Niño events on salmon. Henry, 1985; Pearcy & Schoener, 1987; Pearcy, 1991). Examination of historic catch records confirms that El Niño events and the years just following those events tend to be periods of low coho catches in Washington and Oregon but the low harvests are not single events, they are nested generally in declining catch trends. For example, in Fig. 4.4b it can be seen that the commercial harvest of coho in Washington was relatively low in 1983 and 1984 as well as during the entire period from 1957 through 1964, with a record low in 1960. The Washington coho harvest was also low from 1942 through 1944, following, but not during, the El Niño event of 1940-41. The pattern in Oregon is similar (Fig. 4.4c), with harvests significantly below the long-term trend in 1983 through 1985 and 1958 through 1962.
most likely explanation would be some sort of depression of food supply at the necessary time for adult salmon growth. Comparable weight data do not appear to be available from previous El Niño periods. Considerable interest in understanding ocean survival of salmon has led to the systematic sampling of juvenile salmon in the OPI area. Because of a continuous series of survey data on salmon abundance, location, and growth, it is possible to determine that survival of juvenile coho was extremely poor in 1983 and 1984 (Fisher & Pearcy, 1988). Because the young salmon grew normally in these years despite below-average primary productivity in the ocean, the suspected cause of mortality is considered to be predation by other species of fish and possibly sea birds. Predators may find juvenile coho an alternative prey when natural abundance of normal prey species is decreased by the lower productivity of ocean waters during El Niño periods. Increased rates of predation on juveniles from hatchery stocks may also be a factor (Walters, 1988). No time series data on juvenile survival are available from previous El Niño periods in the northeast Pacific. Under normal conditions, the majority of sockeye salmon returning to the Eraser River enter the Strait of Juan de Fuca where they are first intercepted by US fishers. They then turn to the northeast into Canadian waters where they become available to Canadian fishers. A small percentage of the run usually passes around the northern end of Vancouver Island through Johnstone Strait, migrating southward to the Eraser estuary, and remaining entirely in Canadian waters (see Fig. 4.6). 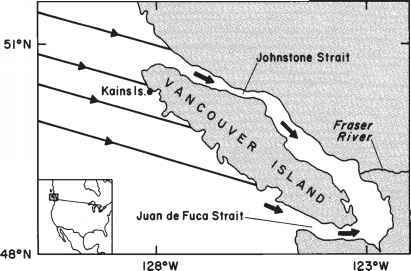 During the El Niño event of 1957-58, there was a major increase in the diversion of Eraser River sockeye through Johnstone Strait with approximately 35 percent of the run following that route (IPSFC, 1959). During the 1982-83 El Niño event, the diversion reached a record high, with over 80 percent of the sockeye run using the northern migration route through Johnstone Strait. The diversion rate appears to have no discernable effect on the abundance of Fraser River sockeye, but it makes a large difference in terms of which nation's fishers find the salmon most accessible. As long as this diversion has been recognized, efforts have been made to understand its mechanisms and to predict its occurrence (Barber, 1983). Speculations on the mechanisms include temperature, salinity, olfactory cues, and sea level. Recent work points to temperature anomalies off northern Vancouver Island as being an important factor (Hamilton, 1985). Warm years in the area northeast of Vancouver Island generally result in higher diversion rates than cool years. Quantitative forecasts made using a diversion model based on temperature appear to predict this phenomenon fairly well (Xie & Hsieh, 1989). Major El Niño periods seem to result in diversion rates higher than other locally warm years. Other effects of El Niño events on salmon have been mentioned in the literature for example, reduction in fecundity, timing of runs, condition of the salmon, etc. - but these are not as well studied as those noted above (PFMC, 1984; Pearcy & Schoener, 1987). Thus, much remains unknown about the biological effects of El Niño on salmon in the northeastern Pacific. In summary, El Niño years can be said to provide a limited but useful set of insights on possible sources of variation in salmon catches but considerably more work is needed to advance this line of inquiry. If El Niño events provide limited "experimental" evidence of the influence of ocean environment, are there other extremes that can provide insights? Some clues may be provided by the period of generally high harvests of coho in Washington, Oregon, and California and of chinook in British Columbia, Washington, and Oregon in the mid-1970s, as well as by the record high total salmon catches in Alaska in the early to mid-1980s. This period coincided with decreased harvests of coho and chinook to the south. Generally, it is thought that the cool temperatures and strong up-welling that were experienced off Washington and Oregon in the mid-1970s provided favorable conditions for salmon survival and growth. In contrast, anomalously warm water in the northeastern Pacific is thought to have contributed to favorable conditions for salmon survival off Alaska in the early 1980s (Rogers, 1984). Fairly long time series of sea surface temperature measurements (averaged) are available for the northeastern Pacific (Fig. 4.7). While these long-term temperature records confirm the cooling off the coasts of Oregon and Washington, and the warming off Alaska, year-to-year variations in temperatures do not appear to correspond closely with variations in harvests, and therefore do not explain all of the variability in catches. This is to be expected because of the multiyear life-cycle of salmon. 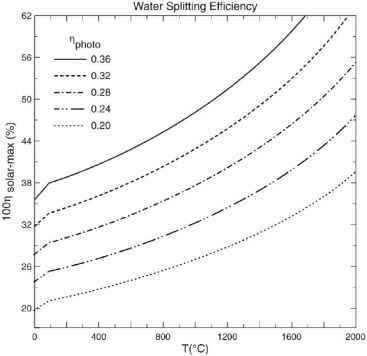 Thus, the underlying patterns of variation are only partially understood. Fig. 4.7 Time series of sea surface temperature averaged over the northeastern quadrant of the North Pacific Ocean. Thin line = 3-month running average; heavy line = 25-month running average (Chelton, 1984).